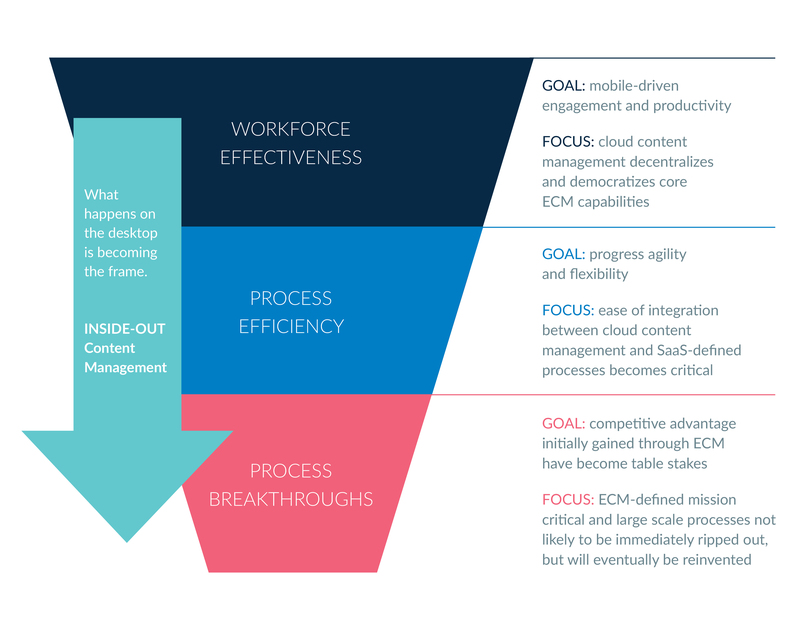 Over the course of the past 20 years, ECM has evolved through three stages — from a focus on process breakthroughs to process efficiencies to workforce effectiveness. 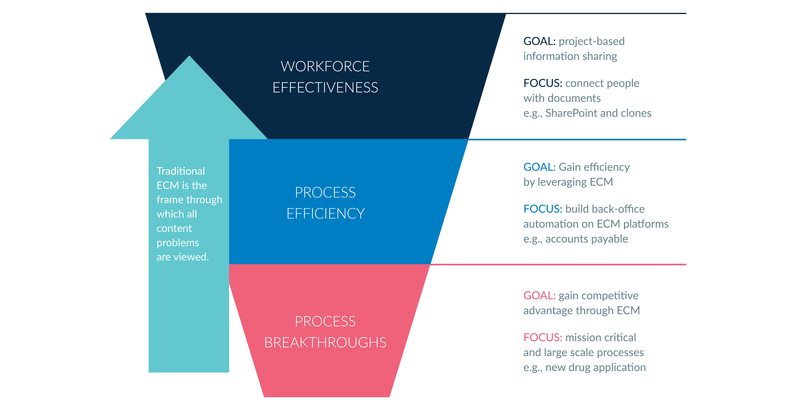 Many of the core assumptions about ECM were defined in the first phase, and then carried forward into subsequent phases.ECM was the straw that not only stirred the drink for breakthrough processes, but also defined how organizations approached core back-end process automation and ultimately how they approached improving workforce effectiveness and collaboration. All of that is now changing dramatically – in fact, it’s being turned inside-out. But before moving to what is coming, let’s focus a bit on how we got to where we are. In the late 1990s, Enterprise Content Management became a mainstream technology (at least for large organizations) by first focusing on early adaptors eager to automate high-value, mission-critical, and document-intensive processes critical to gaining competitive advantage.Examples of these initial “breakthrough” processes include the new drug application process in the pharmaceutical industry, claims processing in the insurance industry, and check processing in the banking industry.User organizations able to successfully “cross the chasm” were able to leap-frog their competitors, and the ECM suppliers who supported them began to look for additional problems that could be solved by ECM. Organizations (and the suppliers who supported them) next applied ECM platforms to solving core back-office automation challenges – like accounts payable, invoice processing, contracts management, and HR administration.Solutions were focused less on spectacular process breakthroughs, and more on driving back-office process efficiencies, cost reduction, and reducing information-related legal and compliance risk.In this environment, the pendulum between information access and information control rested more times than not on the control side of the equation. In the relatively stable business and technology environment of the early 2000s, the rewards were significant.The problems with traditional ECM process solutions (they were expensive, custom, took a long time to implement, had poor usability and were weak on mobility) didn’t really matter because the eventual cost-reduction pay-offs were so significant and ECM solved some pretty serious process problems. SharePoint emerged as a serious player in 2007 as a solution to a different business problem – how to share information across project teams.As disruptive as SharePoint was, it ultimately was viewed through the same traditional ECM frame.Organizations struggled with how to “control” SharePoint sprawl and how to use it as a platform upon which to build ECM-defined business process. Traditional content management – using your initial heavy and monolithic ECM framework as the core set of assumptions for how subsequent content and process challenges were viewed – seemed firmly in place. This core set of assumptions was turned on its head by mobile, cloud, and consumer technologies.By 2015, over 60% of organizations with mature ECM environments reported serious challenges with usability, mobility, rogue shadow IT solutions, and a continued reliance on the dreaded file share for everyday work. Organizations were first attracted by the potential of Enterprise File Sync and Share (EFSS) solutions to solve this set of pain points.At first, IT people sought to either battle EFSS solutions and keep them out of the workplace, or grudgingly bolt EFSS tools onto the sides of their ECM implementations.The heavy lifting – both in terms of process automation and information governance – remained with traditional ECM. Simultaneously, things changed dramatically in the world of back-end business processes.Cloud-driven disruption began to redefine enterprise software models that had lasted for decades.Enterprise SaaS applications created the opportunity to extend first class enterprise capabilities to organizations that never had access to them before.Think about how Salesforce redefined sales automation.Or how Workday redefined HR solutions.Or Netsuite and ERP solutions.The list goes on and on. No longer are the tools used by knowledge workers at the desktop a subset of the tools used to run on-premise, ECM-defined processes.Two radical things are occurring. Processes are being rewritten in the cloud on SaaS models. The content management systems to fuel these SaaS solutions are being determined by what happens on the desktop. End-user centric cloud management and SaaS based enterprise solutions are creating demand for a new, “inside-out” view of content management. Find out out how to combine a SaaS strategy with a cloud content management strategy, and to keep pace with the demands of a changing or growing business. Download this new AIIM tip sheet – 5 Reasons Why the SaaS Revolution Needs a Unified Content Strategy.